Today, we’re chatting with Laura Romagnoli (aka Lallirrr), an artist we discovered on Instagram a few weeks ago. Be sure to check out her web comic, “Average Adventures of an Average Girl,” on Webtoon! 2) We first noticed your art on Instagram when you posted a papercut you had created for “Over the Garden Wall.” Can you tell us more about this? After the end of the first year of Art Academy, I finally had some time for myself and start watching some new TV shows. I had heard a lot about “Over the Garden Wall” by Patrick McHale, so I decided to watch the first episode. I don’t particularly like drawing fan art, but I liked the series so much I just had to draw something! I first did a digital illustration about OTGW but I wasn’t that satisfied about it so I decided to try a traditional version of it. Over the past year I collected some nice pieces of coloured paper so I decided to use some of them and do a papercut illustration. I’m still new to this kind of art so I mostly cut out simple shapes, but it is a real fascinating style of art and I’m planning to improve and, eventually, master it! 3) From “Over the Garden Wall” to your Mad Max: Fury Road watercolours, it seems like television and film adaptions are quite prominent in your work. What is it about taking art from screen to page that inspires you? I’m a really instinctive person, so the first things I see when watching a movie or a TV show are colors, figures and shapes. When something catches my eye, it remains stuck in my head until I draw it out on paper. Also, my current roommate is a big movie and TV show nerd so I have been watching a lot of movies lately. Plus, the various storylines, scenes and movie shots are a big source of inspiration for my comics! 4) Your artistic talents are pretty diverse! How did you get into drawing, watercolours and paper cutting? I started drawing when I was really young (kindergarten, I think?) but I discovered that drawing was, and is, my passion only around middle school. I’ve always been self-taught, so when I enrolled into Art Academy and started studying and experimenting with all the various kinds of art it blew my mind seeing how many different ways I had to express myself. And, of course, the internet made me discover new awesome artists and techniques to follow! And, I gotta admit, I love all those colorful patterned papers that are used for papercut illustrations and collages. 5) Has anyone, or anything, in particular inspired your creativity and artistic passion? I have a neverending list of amazing artists, art styles, art periods, comics, paintings, books, movies and much more that inspire me, so it would be impossible for me to name them all. Currently, I’m looking up to Jaw Cooper and Josan Gonzalez‘s amazing art! I’ve been in love with Moebius and Sergio Toppi’s art style and comics for a while now. And, of course, I love Tim Burton and Jean-Pierre Jeunet’s movie styles! They give off this inexplicable feeling that just drives me crazy! Also, my daily life experiences and common everyday things inspire me a lot. 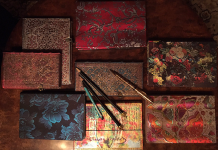 6) Why did you choose a Paperblanks® art journal to work with? I’m kinda new to the art journal world, as I’ve been sketching and drawing in journals for only a year now. The first journal started out as a daily planner, but keeping the journal in my bag wherever I went gave me the possibility to sketch around the city and draw more often than usual. When I completed my second journal I decided to buy a journal with a kind of paper specific for art and sketching so I could use ink and watercolors without worrying about ruining the whole journal. 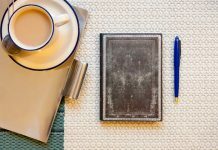 I had always admired Paperblanks® journal designs but I thought that with such pretty covers the quality of the paper couldn’t be that good. But my 21st birthday arrived and one of my dearest friends bought me a Paperblanks® art journal as a present and I totally fell in love with it. I was scared of ruining the pages with watercolors, Copics and other coloring tools but I happily found out that the pages could totally take those media so I now can let my creativity express itself freely! 7) Have you received any formal training in the arts? Sadly, I havn’t. The Art Academy I’m currently enrolled in is the first art school I’ve ever attended. But I’ve improved a lot since last year thanks to the art academy environment and classes (being with other artists and sketching all together helps my mood and the quality of my art a lot!) and to a comic class provided by PGM cultural association in Bologna. 8) Any advice you would like to share with aspiring artists? Never stop drawing. Never give up. Never underestimate yourself and your own art. Never listen to others telling you that drawing is a waste of time. It’s your life and you have the right to pursue your dreams! And BE CURIOUS! The best thing you can do for yourself is to explore the world, yourself and everyone around you; discover new things every day to keep yourself inspired! I am indeed! My dream job is to one day become a comic artist and publish my own comic book, and I’m getting closer to it each day! I came in 2nd place in the LINE Webtoon Challenge League and I’ve been publishing my very own webcomic “Average Adventures of an Average Girl” on LINE Webtoon since last March! It’s a comedy/slice of life comic about (guess what?) average adventures of Average Girl, the main character of the story. It is a great opportunity for me and I sure am hoping to collaborate with LINE Webtoons for a long time! In the meantime, I’m researching and studying for a new comic story that I’ve had in my mind for a long time now, so be ready to read a new webcomic sometime soon!